Film reviewers like me frequently get accused of being unable to appreciate films designed purely to entertain. But while we may spend a lot of our time directing people towards films in which entertainment may not be top priority, we are as capable as the next punter of having a good time. The Guard is the latest film to prove this, being the most purely entertaining film since Scott Pilgrim vs. the World. From a cineaste's point of view, The Guard contains a great number of familiar genre elements. It has described as a cross between Lethal Weapon and Father Ted, and there are strong hints of both throughout. The pairing of Brendan Gleeson and Don Cheadle is in the buddy cop style, with one being by-the-book to the point of being inept, and the other being a loose cannon who is unprofessional but gets the job done. The shots of the landscape in and around Connemara resemble the opening credits of Father Ted, and there are occasions when Gleeson's facial expressions copy those of Father Dougal. The film is also deeply rooted in the conventions of westerns. Gleeson's performance has been specifically compared to Gary Cooper's in High Noon (high praise indeed), but more generally the film corresponds to the stock western plot of the irascible, antiheroic sheriff defending his town from simple-minded crooks. From a more European perspective, one could compare The Guard to the 1930s comedies of Will Hay: there are hints of Ask a Policeman in the role of smugglers, and Oh Mr. Porter! in the Connemara settling and the seeming simple-mindedness of the characters. 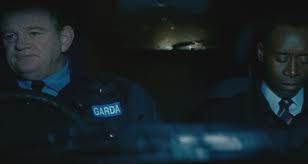 The Guard is the debut film from writer-director John Michael McDonagh, whose brother Martin McDonagh previously worked with Gleeson on In Bruges. As with his brother's debut, the stock plots and familiar conventions of The Guard are a springboard to create interesting characters and carve out a distinctive niche through strong language and violence. But The Guard emerges as the superior film, for two clear reasons. Firstly, the film benefits from a low-budget aesthetic. Because In Bruges looked relatively glossy and was flashily directed, it led you to expect something very polished and balanced, so that whenever the more constrictive elements of the plot encroached, you felt somewhat underwhelmed. The Guard doesn't have the luxury of looking like an expensive film, with understated camerawork and a more washed-out colour palette. But this has the side effect of allowing the script to breathe, so that we are less conscious of the clichés when they do come to the surface. Secondly, The Guard benefits from a relative lack of archness in its characters. Both filming are incredibly knowing in their construction of dialogue, from the police officers discussing Fellini's 8 1/2 to the lad with the camera commenting that the events that transpired would make a really great book one day. But where In Bruges occasionally felt like it was showing off, being arch for its own sake, The Guard puts the brakes on all that very quickly. The characters feel more genuine and more immediately likeable, even in their most questionable or archetypal moments. 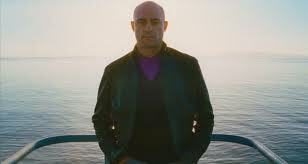 One of the best examples of this latter trend comes in the performance of Mark Strong. He plays a British gangster hired by the Irish mob to oversee the cocaine smuggling operation, and is as much a fish out of water as Don Cheadle's character. In one of the best scenes in the film, he delivers a bribe to two corrupt police officers, who offer up clichéd lines like "It's all there?". Strong's response is sarcastic but smart, pointing out not only the inherent stupidity of their question within the confines of the film, but also the silliness of a particular generic convention. His character embodies the part of our brain that says "well that wouldn't happen", and seeing that urge physicalized is a real delight. There is a similar intelligence with regard to the distinctly un-PC humour of Sergeant Gerry Boyle. 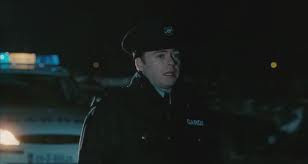 The script for The Guard is fantastically bad taste and walks the tightrope between laughter and pain with perfect balance. You'll quickly lose count of the number of times you'll laugh yourself stupid, squirm in your seat, or do both at once whenever Boyle opens his mouth. One particularly funny faux pas occurs when Boyle and Everett are having breakfast, and the conversation moves on to skiing. Boyle remarks: "I thought black guys couldn't ski?". Awkward pause. "Or is that swimming?". Such scenes recall the Father Ted episode 'Are You Right There, Father Ted? ', in which Ted is accused of being a racist and attempts unsuccessfully to put things right. Both are attacking racists and racism by showing how utterly absurd and pitiful such statements or attitudes are. Boyle has the same misplaced innocence as Father Dougal and does not understand that what he is saying is wrong or insensitive: when berated for his remarks at the FBI briefing, he remarks that racism is part of his culture. We may find Boyle likeable as a character, but the film doesn't use ignorance as an excuse to condone any of his vices, whether racism, drinking, or using two hookers on his day off. We laugh at the statements and the characters, rather than with them. But in the midst of this knowing use of racial epithets and black humour, there is a more melancholy side to the film. Boyle may be unconventional, but he is not entirely a happy-go-lucky buffoon who has everything he needs and couldn't care less. There are several scenes where he visits his dying mother, scenes which make us laugh by showing where he got his spirit from. But these moments, and those featuring the young children, are reminiscent of Being There, contrasting the well-meaning, almost clownish central character with the dark world around him. In Being There, the gag was that whenever Chance spoke his mind, people read into his words and behaviour as if he were a guru, rather than just the sheltered child whose only life experience was in tending gardens. Boyle may not be sheltered, but there is a through-line in the characters' growing acceptance of his value as a member of the force and an ultimately upstanding human being. As Everett remarks early on, "I can't tell if you're really motherfucking dumb, or really motherfucking smart", though by the end he has clearly made up his mind. The Guard hangs on the brilliant central performance of Brendan Gleeson. He is clearly enjoying himself, taking McDonagh's script and breathing life into the character though naturalistic mannerisms and great comic timing. He improves on his performance in In Bruges and is as commanding a screen presence as he has ever been. 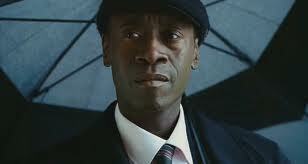 Don Cheadle compliments him perfectly, proving his comedic worth by playing everything poker straight. The montage of him attempting to interview the locals, including a horse, is a particular highlight. Taken as a piece of pure, undiluted entertainment, The Guard is one of the best films of the year. It is deeply generic and occasionally its low-budget aesthetic works against it, with the sound design rendering some of the thicker accents inaudible. But those are little niggles which fail to tarnish a hilarious and beautifully constructed black comedy. 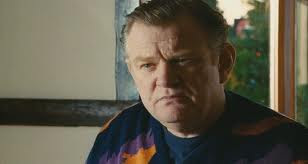 Brendan Gleeson has given interviews suggesting that the McDonagh brothers have a friendly rivalry. On the basis of this, it's one-nil to John.